Home » Announcements » Where’s My St. Croix Valley Gifted eNews? You would like to start receiving St. Croix Valley Gifted eNews for upcoming events, GT resources, or info about this chapter and MCGT? Click here to provide your name and email address so you can start receiving future editions. We never share our contact list with any other groups or organizations. Interested in previewing a past edition of our eNews first? We archive the past year of our newsletter here. You’re welcome to take a look! We won’t archive the current school year’s editions until Summer. You’ll want to get on our mailing list to receive the latest updates on a timely basis. Haven’t seen an issue of our monthly eNews recently? Please check your email settings or preferences — it’s likely your email tools are directing our regular updates somewhere other than your inbox. This is especially true if you’re using a free email service (ex. GMail or Y!Mail). Without a custom filter, GMail tends to drop newsletters into a Promotions folder. 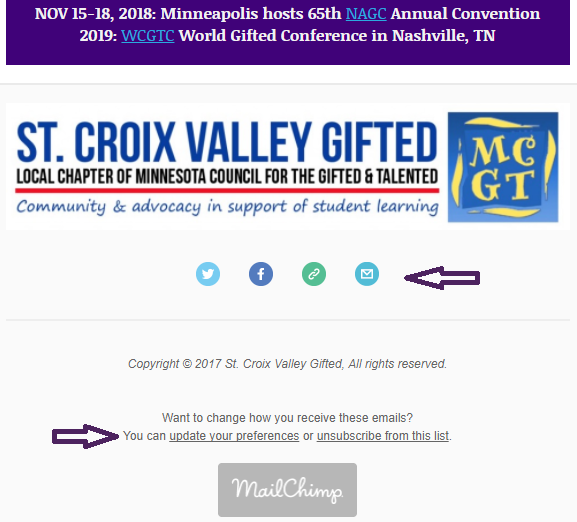 If you don’t remember to check there regularly, consider adding a message filter that redirects messages from St. Croix Valley Gifted to your inbox or a separate GT folder. The GMail Promotions folder either appears as a tab above your inbox or in your list of mail folders (inbox, drafts, etc.) under ‘Categories.’ Visit the GMail support pages for related instructions, or check similar support pages for your email provider. 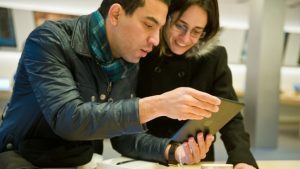 If you’re using Outlook, Thunderbird, or another email client on your Mac, PC, or tablet, info under the Help, Settings or Preferences menu should offer guidance for creating a custom filter. Need to change the email address where you receive St. Croix Valley Gifted eNews? Track down a previous eNews message or wait for the next one to arrive at your old email address. In the footer at the bottom of every newsletter, below the social media icons, just click the update your preferences link where you can make an update. If it’s easier, send us a message with both your old and new email addresses and we can make the change for you. Can Educators and/or people who aren’t MCGT members receive St. Croix Valley Gifted eNews? Yes, definitely! We send a version of our eNews to interested community members and to all area school principals and counselors. We also sometimes send eNews to area teachers and school board members. If you are not currently receiving our newsletter, are a recent staff or family arrival at a St. Croix Valley area school (preK – 12), are homeschooling locally, and/or you’re a community member interested in learning more about local supports for GT learners, please contact us with your name and email address to get on our educator mailing list. Please attend one of our chapter meetings or other local events and introduce yourself! Does MCGT have a social media page or account I can follow? MCGT maintains a Facebook page where anyone can learn more about the organization and topics of interest, plus a Members Only Facebook group where members can discuss GT supports and services, share experiences, ask for member input, learn about local enrichment offerings, and more. New MCGT members can message the group administrator directly on Facebook to be approved for access. MCGT also is on Twitter under @MCGT_Tweets. NAGC also has both a Facebook page and member group, plus a Twitter account. St. Croix Valley Gifted does not keep separate social media accounts. Our eNews and this website serve as the main sources of chapter info, plus we provide chapter meeting updates on the MCGT Facebook page. 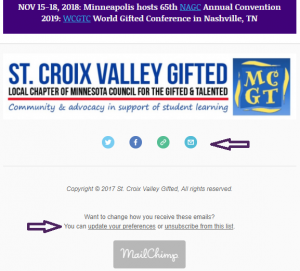 St. Croix Valley Gifted makes independent choices about what to place in the newsletter, so you will receive unique content from us vs. MCGT’s social media presence.